[Question] - How old is Kirby? I posted this question earlier to Meta Naito, but we were unable to make much headway. Can you point to any knowledge or lore that might give us an answer to this question? This is a pretty interesting question. 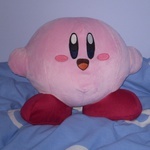 My personal headcanon for this is that it takes Puffballs--the name I call Kirby's species--a few thousand years to mature. Since Kirby, generally speaking, seems to act as if he is about a year or two old in human years, my headcanon for Kirby's age is that he is a few hundred years old. Indeed, seems all we have is conjecture and headcanons. I wonder if there's a blurb anywhere in a game manual, particularly a Japanese one, that might help us unravel this mystery. What is a Poyo? Kirby is a Poyo. He's the ancestor of all Poyos. Are you sure Kirby isn't the last son of the Halcandrans, like Superman is for the Kryptonians? That looks like an interesting theory. However, I may or may not hold that theory. In my headcanon he can actually inhale when he doesn't wear a mask. He just never does it, because he is better with the sword. Unfortunately for the Halcandrans, the only person they could find to look after Kirby was a LARPer. I often view Meta Knight as Kirby's mentor.